Hot of the sewing machine, six new scarves (and soon to be kimonos) are available on my shop. These patterns are result of my 2018 artist residency at Phipps Conservatory and Botanical Gardens, where the corresponding paintings are on display in my latest exhibition, Deepening Roots: Our Growing Connections to the Botanical World. I like to think they’re a much needed and vibrant reminder of what grows in warmer months ahead. Now through March 17 at Phipps Conservatory and Botanical Gardens, artworks from my latest artist residency are on display. 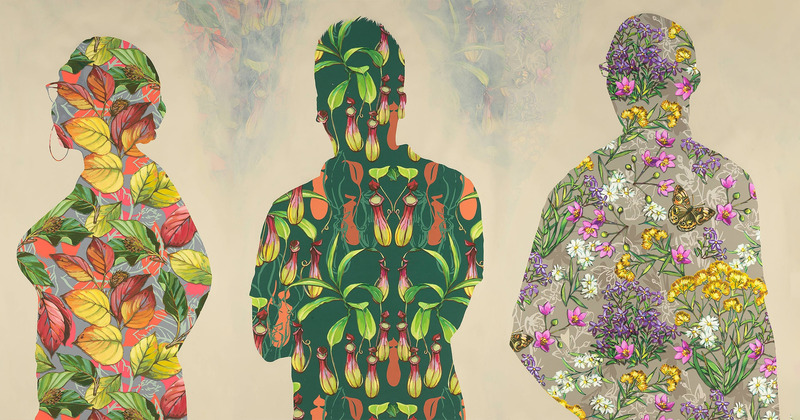 The exhibition, Deepening Roots: Our Growing Connections to the Botanical World, highlights the essential roles plants play in the lives of all humans, from the clothes on our backs, the frames of our homes, the food on our plates and much more. This exhibition explores six of these deep bonds we share with the botanical world, some familiar and some unexpected. These “plant profiles” are the result of my six months at Phipps, which allowed me to explore ways plants support and enhance human well-being. The most profound examples became the subjects of my paintings, which I translated into patterns and then overlaid with silhouettes of inspiring individuals whose work embodies that connection, from a food security advocate to a nature-inspired material scientist. The exhibition catalogue details each painting and highlights the entrepreneurs, scientists, land stewards and more who are harnessing the plants’ botanical benefit. My habit of embedding myself where you wouldn’t expect to find an artist has most recently led me to Phipps Conservatory and Botanical Gardens, where I’ve been serving as an artist in residence since July. I’ve taken a deep dive into learning about human relationships with plants, and that is the very subject of my upcoming exhibition of residency artworks at Phipps opening on January 11, 2019 (and save the date for the closing reception and artist talk on March 7). I’ve spent hours in the greenhouses asking questions about the ways plants serve people. The scientists, horticulturists, educators and more were happy to indulge my inquiries, since they love any opportunity to gab about nature. With my sketchbook in hand, I jotted notes about the intricate ways plants provide for us, protect us and delight us. These powerful gifts often go unnoticed, although examples of their vast contributions to human welfare are everywhere – from the clothes on your back to the wood forming your home. And so I started making paintings of the best examples. I translated those paintings into the repeating patterns below and now I’m in the process of adding the human element. This week I’m overlaying each of the six botanical patterns with the silhouette of someone from southwestern PA whose work embodies the human/plant connection, from a food security advocate to a nature-inspired material scientist. Each painting is a celebration of plants that serve our human interests and an individual harnessing that botanical benefit. I hope, come January, it will inspire or deepen your biophilia, or love of nature. It’s a pretty big deal to be invited to exhibit my work at Phipps Conservatory and Botanical Gardens. And it’s an even bigger deal that the exhibition, Birds and Botany, is up during the holiday season. If you’ve ever been to Phipps during winter, you are well aware of the massive droves of people the holiday lights draw in, and my work greets the hundreds of thousands of visitors as they queue to get tickets. I like to think I’m offering visual enjoyment while they wait. The show includes my original artwork resulting from my 2016 artist residency at the Carnegie Museum of Natural History, as well as the related wallpaper, handmade scarf, and bird-safe window films. The paintings and scarves are available for sale at Phipps. The wallpaper and window films are special orders – shoot me an email for details. The show is up well into 2018. I hope you’ll brave the cold to see it (the tropical temps inside the greenhouse make it especially worth it this time of year). Fellow artist Deirdre Murphy and I will discuss how work in our new exhibition connects visual art with nature and science. Please note the presentation will be given in the 1st-floor classroom of Phipp’s Center for Sustainable Landscapes.